Does Russia still belong in this exclusive club? The country may not have the internal demand to decouple but can Russia survive without US led growth? Jim O’Neill, Chief Economist for Goldman Sachs, initially predicted that by 2041 (now modified to 2032) the BRIC economies would overtake the six largest western economies in terms of economic might. More than anything Jim O’Neill’s club of emerging countries has created a new way of perceiving the future, suggesting that in the not too distant future the western world might be relegated to playing second fiddle to BRIC’s first violin. What was unthinkable ten years ago has started to become an accepted norm. 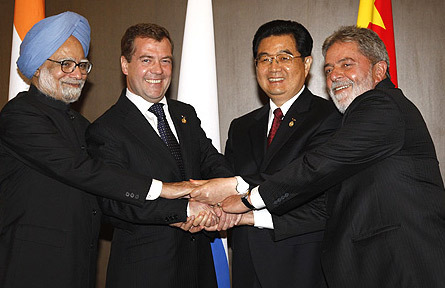 The BRIC economies, Brazil, India, Russia and China. appear to have little in common but they were originally lumped together for three fundamental reasons: their large populations, their developing economies and the fact that they all have governments that appear keen to integrate their economies on to the global markets and adopt certain aspects of globalisation. These three characteristics made them stand out as the potential economic locomotives of the future, particularly as they all had the potential for rapid future growth. Some say the BRIC story is marketing hype, just a tag for salesmen to hang a story on and a chance to generate even more fees and put Goldman Sachs further into the limelight. It is not all hype. Since 2003, the BRICs stock markets rose from 2 to 9 % of global market capitalisation, and it is forecasted they will account for almost 50% of global market capitalisation in 2050. So did the market crash and ensuing recession not dismantle the BRIC story? Not at all, Most of the BRICs emerged from the crisis well, relative to the economies of the western world. Their banking systems are intact (Russia may be the exception here), and their economies are still growing. In 2009, emerging markets had an exceptional year, with the MSCI Emerging Markets Index reaching 74.5%. The bets were on in 2008 when the crisis hit whether the much trumpeted “decoupling” that was meant to happen would really take place. Would the absence of FDI in emerging markets lead to a disaster or just be a blip on the radar with domestic demand taking over where FDI left off? Decoupling was never really tested as foreign investors did retreat at a gallop initially causing the bottom to fall out of local stock markets but with an absence of anywhere else to invest the BRIC story was once again being trumpeted as the future of global growth and money poured back in again. The Russian market recovered but not as a result of domestic demand taking over, that would never have been an option but as the Russian index basically follows the trend in the oil price investors moved back into Russia perhaps feeling that they at least had some sort of a handle on what was happening in Russia. The Chinese are living off a recovery package that has sustained the economy but some observers are nervous about unemployment trends that see not hundreds of thousands of people hitting the soup kitchens but tens of millions at one go. Ironically, times have been so good for BRICs that some commentators are signalling danger, suggesting that emerging markets are already surging toward an investment bubble. Will all the BRICs develop in a parallel fashion? This is unlikely, as the political realities are so different. Russia has a government overrun with incompetent intelligence service veterans whose modus operandi is a little heavy handed to say the least, serious corporate governance issues, an anti-democratic political framework and a rapidly developing kleptocracy. China has unemployment figures that would make any economist blanche and they are performing a political high wire act that will eventually unravel. It is impossible to improve people’s general well being and then ask them to renounce all political governance over their own lives. Giving someone half a carrot is more dangerous than giving them a whole one. China is trying to ignore the grim reality of its own firmly entrenched dual personality. Capitalism thrives either in a free society where information is accessible to all therefore creating a level playing field or in a society based on slave capitalism where exploitation becomes institutionalised. The latter never lasts, state piracy does not lead anywhere any more. The key question was: could these four countries, and by definition everyone else live without the US as the fulcrum of global economic growth? The answer appears to be “yes” which in itself has changed the global financial equilibrium in people’s minds. However, Russia appears to be the country that may not deserve membership of the club as the economy is overly dependant on oil and gas revenues. The economy is also struggling with its foreign debts, potential inflation risk, political uncertainty and a teetering banking sector, but as long as the market keeps moving in the right direction investors will continue to ignore the gloomy sociology and political science. Perhaps more unsettling is the news about the country’s sovereign fund, its money set aside for a rainy day that is being spent with gay abandon but a realist might well say, that this is exactly what the fund is for, this is indeed a rainy day, so spending makes perfect sense. Nevertheless, Finance Minister Kudrin recently claimed that the Reserve Fund of the Russian Federation—one of the two components of the Stabilization Fund set up in 2004 to serve as a safety net generated by oil profits—will be fully liquidated in 2010 due to government deficit spending. So what would this mean? Probably just that the Russian bond market would begin to flourish although with oil prices in the low $70s the Kremlin will not be really struggling yet. The BRIC story has a long road to travel but so far the narrative holds.